A walking holiday in Italy, a country blessed with an amazing variety of landscapes, is high on the wish list of enthusiastic walkers and hikers worldwide. With this article on walking in Italy we aim to give you a good idea of what Italy has to offer to the walker. We discuss the main mountain ranges in the country, starting with the Italian Alps and moving down the Apennines. We also discuss Tuscany and Sicily briefly, before providing information on the most interesting Italian National Parks for the walker. Finally there is information about Italy's climate and weather, and the best time for a walking holiday in Italy. 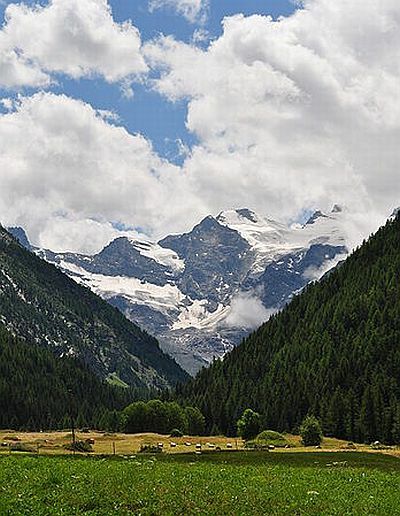 The Italian Alps are popular walking holiday destination. The main mountain ranges in Italy are the Italian Alps and the Apennines. The Italian Alps run all the way along the northern borders of Italy, while the Apennine mountains form the backbone of the country, running all the way north-south through the length of the country. The Italian Alps can be subdivided into a number of distinct regions or smaller mountain ranges. They are presented here roughly as they are found from west to east in the north part of Italy. The Paghera Valley in the Italian Alps. Location of areas popular for walking in the Italian Alps. Thye Ligurian Alps run along the border with France, close to the Mediterranean. They form the south-western extremity of the Alps, with parts also located in France, bordering on the Maritime Alps. The highest peaks reach just over 2600 m, and the landscape is rich in contrast, consisting of karts terrain with many caves, waterfalls, small lakes, woodlands and an interesting and partly edemic flora and fauna. The mountain range is located close to the Mediterranean coast, with the coastal region bordered by the Ligurian Alps and the Appenine mountains. The combination of authentic culture, sea and sun with mountains is an attractive combination for a walking holiday. Also see Trails of Liguria - guided walking holiday. Part of the Ligurian mountains in Italy. The Cottian Alps are part of the Western Alps, running along the border with France. There are more than 30 peaks that are higher than 3300 m, with several smaller glacier present. The landscape around the region's highest mountain, Monte Viso (3841 m) is most dramatic. There are many passes in the area, with the one dividing the Cottian Alps and the Graian Alps being the lowest mountain route through the Western Alps. It is thought that Hannibal used this route when he marched into Italy in the third century BC. View on the Cottian Alps in Italy. The Graian Alps are found in France, Switzerland and Italy and include the Mont Blanc massif, with Western Europe's highest mountain. The area is generally divided in a number of distinct areas. The Mont Blanc massif is partly located in France, and partly in Italy, and partly in Switzerland. The Mont Blanc is 4810 m high, with the highest peak located just on the borders of Italy and France. Many people climb the mountain from the Italy, following the route that is known as La route des Aiguilles Grises. About 20,000 mountain walkers climb the mountain each year, but care should be taken. The ascent is relatively easy, but the ascent is long and it is necessary to adapt to the changes in altitude. Walking in mountains this high is always better done with trained mountain guides. There are a few impressive glaciers in the area, including the Miage Glacier. The Aosta valley with the Mont Blanc Massif in the background. 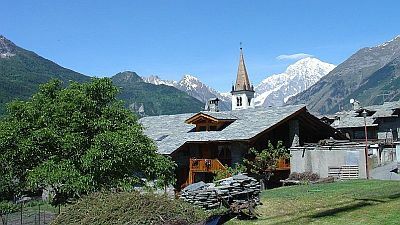 To the South of the Mont Blanc massif, the Aosta valley drains the area towards the Po river. South of the Aosta valley, the Graian Alps are known as the Eastern Group, and includes the impressive Gran Paradiso peak at 4016 m. This is the only mountain in Italy that lies entirely in Italy and is over 4000 m in height. Climbing it is considered to be relatively easy, apart from the last 60 m to the top. 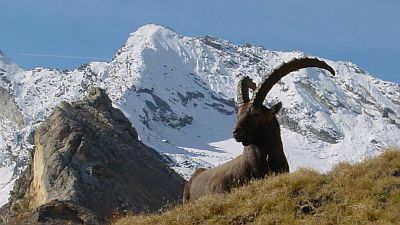 A large part of the Gran Paradiso massif has been designated a national park, the Gran Paradiso National Park that is discussed further below. View on the Gran Paradiso massif from Cogne. 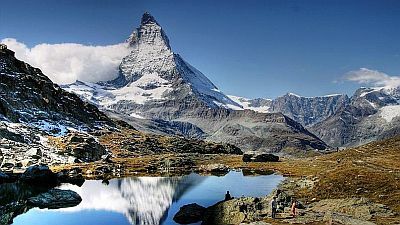 The Pennine Alps is one of the most impressive mountain chains in Europe, including such famous peaks as the Matterhorn and the Monte Rosa, both located on the border of Italy and Switzerland. There are generally many high mountains of over 4000 m in the area, and ten of the twelve highest mountains in the Alps are found here. There are also several glaciers, but most of them are located in Switzerland on the north slopes of the mountains in the Swiss part of the Pennine Alps. The Monte Rosa peak, known as the Dufourspitze, lies just in Switzerland and is the highest point of the Pennine Alps at 4634 m. The name Monte Rosa comes from the word "rouese" which means glacier. There is indeed a large glacier present, known as the Gorner glacier, on the West side of the mountain, flowing to Zermatt in Switzerland. 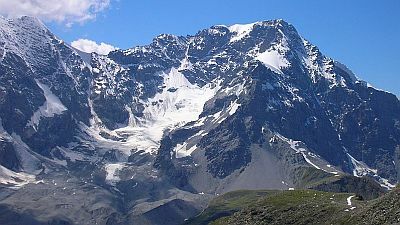 The smaller Monte Rosa glacier is located in Italy. The mountain lies very close to the village of Macugnaga where a 2400 m wall of rock rises steeply above the village. Popular with mountain walkers is the Tour of Monte Rosa. It takes 10 days to complete the circular route, following many ancient paths that connected the Swiss and Italian valleys. 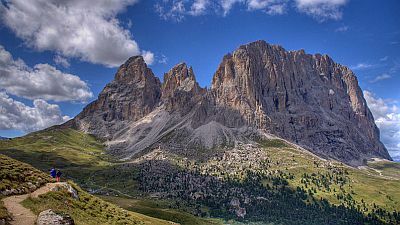 The Val Grande National park lies in the east of the mountain range, and is further discussed in the National park section. Also see Walking in the Italian Alps - self-guided walking holiday. The pyramidal shape of the famous Matterhorn. The Matterhorn, Monte Cervino in Italian, has always been an intruiging and challenging mountain. The name comes from the German words for Matte meaning meadow and Horn which means peak. It is an iconic mountain of the Alps in general and its first ascent marked the start of the golden age of alpinism and mountaineering. The mountain is fairly isolated with a characteristic pyramidical shape, each face facing one of the compass points. Because the faces of the mountain are so steep, snow does not really cling to them, regular avalanches bring the snow down to glaciers below. The Matterhorn was one of the last Alpine peaks to be climbed, not because it was such a difficult climb but more because the mountain instilled widespread fear among mountaineers. The north face remained one of the last big wall climbing challenges before it was finally climbed in 1931. Today, mountain guides take a large number of people up the Matterhorn via the north-east route with the route classed as fairly difficult. West of Trento, Bolzano and the Dolomites lie the Ortler Alps. The highest peak, the Ortler, or Ortles in Italian, lies in Italy and is 3905 m high. The area consists of high, glaciated mountains, and in particular the Stelvio National Park is good for hiking and walking, which is further discussed below. Just north of the Ortler Alps, a small part of the Ötztal alps are found within the Italian borders. The peaks of this mountain range form the border between Italy and Austria. The range has become known also because of the discovery of Ötzi, the ice man, who was found in Italy close to the Austrian border. Otzi is a well-preserved mummy of a man who lived about 5,300 years ago who was found in a glacier. The discovery has given archeaologists an unique insight in copper-age man. The South Tyrol Museum of Archaeology in Bolzano, the capital of South Tyrol, has an extensive exhibition on Ötzi. 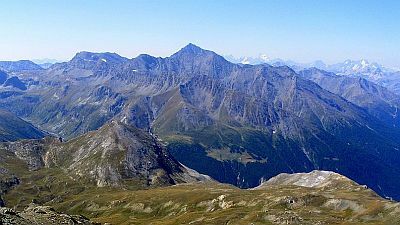 View on the Ortler Alps with the Ortles peak on the right. 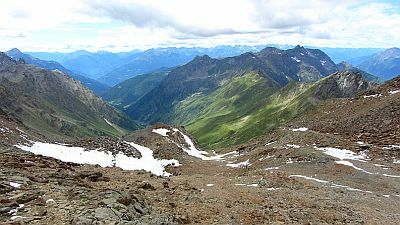 The Zillertal Alps mountain range is named after the Ziller river, that runs to the north-west of it. 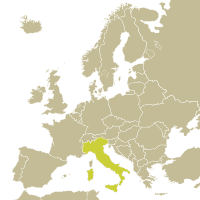 Part of the range is located in Austria, and part in Italy. The highest mountain, the Hochfeiler or Gran Pilastro lies just in Italy and is 3510 m high. 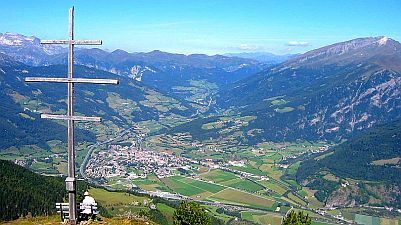 The Zillertal Alps are high and the well-known Brenner pass forms the only north-south connection through the mountains for motorized vehicles. However, also for walkers there are only a few places where the mountains can be crossed. The mountains are glaciated above 2500 m, although the substantial glaciers are located on the north side, in Austria. 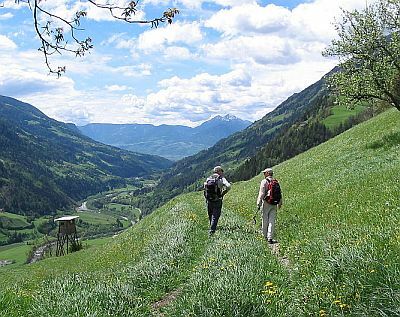 There are many trails and footpaths in the Italian part of the Zillertal alps. Well known routes include the Alta Via di Fundres/the Pfunderer Höhenweg. 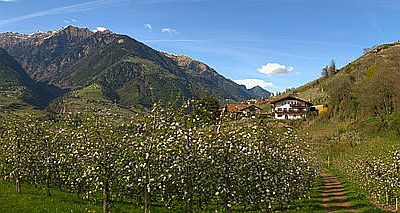 At the foot of the Zillertal Alps in Italy. The Dolomites are widely regarded as one of the most spectacular mountain ranges in Europe, and are a true mecca for walking and hiking holidays. Typical for the Dolomites are green rolling alpine meadows and pastures with steep limestone cliffs and pinnacles suddenly rising to great heights. These rocks and mountains consist of very typically pale or rose-coloured rocks, and the landforms have been likened to towers, castles and cathedrals. The famous Swiss architect Le Corbusier called them "the most beautiful architectures on earth". The Dolomites in Italy are a very popular walking holiday destination. The rocks of this mountain range started to form about 200 million years ago, in a tropical marine environment. Evidence of the marine life, coral reefs and atolls can still be seen in the mountains today. Later, volcanism covered these marine rocks with volcanic products, and this period was again followed by the formation of marine sediments. About 230 million years ago, when the first dinosaurs started to roam the earth, the general area began to sink and a muddy lagoon formed where plants created deposits of carbon. This was followed by another long period (the Cretaceous period) during which limestone and marl were deposited. Finally, only about two million years ago, the Eurasian and African tectonic plates collided, forming the Alps and also the Dolomites, resulting in the spectacular high mountains and peaks we can see today. Since then glaciation has further carved and formed the mountains. The Dolomites have been named after a geologist, Déodat Gratet de Dolomieu, who quickly realized he had come across a unique type of rocks. 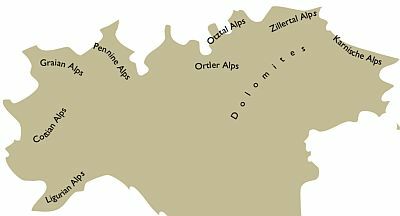 In the past, the Austrian - Italian border ran through the Dolomites. This border was the scene for heavy fighting during world war one. Special routes were build to help troups and supplies to move around. 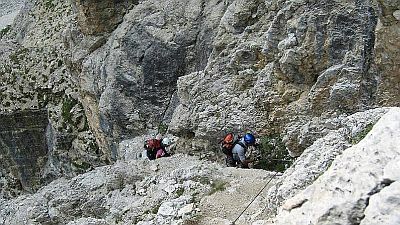 These routes were later converted to the "Via Ferrata", exposed mountain trails and paths with support ropes and cables. Many new Via Ferrati have been established in other parts of the Dolomites. The The Torri del Vaiolet in the Dolomites. The impressive landscapes and natural beauty of the Dolomites make them one of the most popular walking holiday destinations in Europe. There are many marked trails and footpaths, both in the valleys and in the higher mountains, and many lifts and gondolas to easily reach higher trails. And of course there are the Via Ferrati too. The climate is also very good, with the Dolomites having relatively sunny and stable weather compared to many other alpine areas. 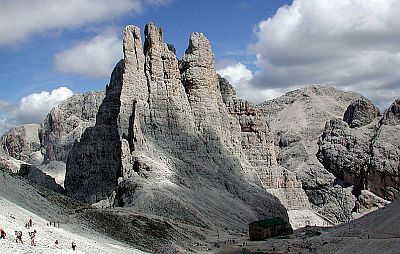 In 2009, the Dolomites were designated as a World Heritage site by UNESCO because of the area's unique natural beauty and importance geologically. The Dolomiti Bellunesi National Park is also located in the Dolomites, and is discussed further below. 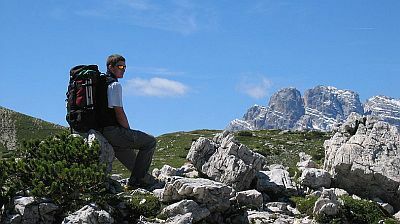 Also see Walking in the Dolomites - self-guided walking holiday. The Apennines is the long mountain chain that forms the spine of the Italian peninsula. In the north they connect to the Ligurian Alps, and they run all the way south to the island of Sicily. The Apennines were thought to be part of the Alps, but now it is clear that they have always been a separate mountain chain. The Apennines rose from the sea millions of years later than the Alps were formed. It is thought that the name possibly originates from the time when the Celts dominated north Italy around the 4th century BC. The Celtic word "Penn" means "mountain" or "summit". The Apennines are normally divided into several regions, the Northern Apennines, the Central Apennines and the Southern Apennines. Most of the north and parts of the Central Apennines are verdant with lush vegetation, to the south the mountains are semi-arid. The eastern slopes are generally quite steep, while the western slopes descend more gradually. The different areas of the Apennines are discussed separately below. The north part of the Apennines is divided into the Ligurian Apennines, the Tuscan Apennines and the Umbrian Apennines. The Ligurian Apennines - Appennino Ligure in Italian - almost connect to the Ligurian Alps in the west of Italy. The range contains dozens of peaks with the Monte Maggiorasca being the highest at 1780 m. The range follows the arc of the coastline, giving the attractive combinations of walking, mountains and the sea. A bit further south the Tuscan Apennines - Appennino Toscano in Italian - are found. 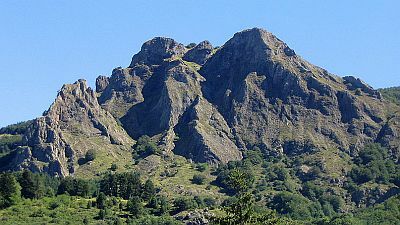 The highest point here is Monte Cimone (2165 m). 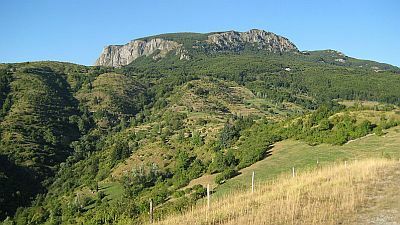 The south part of the Tuscan Apennines is roughly found near the Foreste Casentinesi, Monte Falterona, Campigna National Park (see further below). The whole of Tuscany is a very popular destination for walking holidays, and further discussed below. The Umbrian Apennines - Appennino Umbro in Italian, are not clearly defined, because it is very difficult to properly distinguish between the Umbrian mountains and the mountains of the Marches further south. As a result, there is also discussion about what the highest mountain of this part is. Generally though, the Umbrian Apennines are said to be located mainly in Umbria, while the mountains in Marches (le Marche) are considered Central Apennine. Umbria in general has a range of terrains for walking, hiking and trekking and the Umbrian Apennines have many scenic trails and footpaths to explore during a walking holiday. The Central Apennines are found in the regions of Abruzzo and Le Marche (also known as the Marches in English). Some of the highest parts of the Apennines are located in Le Marche, with the highest peak, Monte Vettore (2478 m) located in the Sibillini mountains. 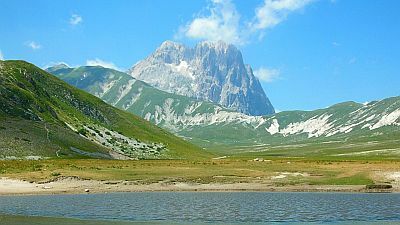 Here you will also find Sibillini National Park, great for walking and hiking, that is further discussed below. The range is heavily forested and also known as the green heart of Italy. The tiny republic of San Marino is found in the northeast of the Central Apennines, on the slopes of Monte Titano. 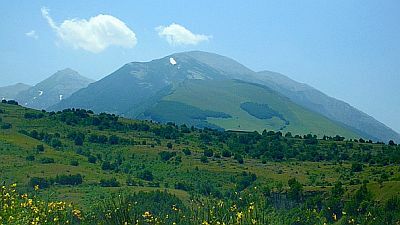 The highest point and most rugged mountains in the Apennines are found in Abruzzo. Here the Gran Sasso d'Italia mountains include the highest summit, the Corno Grande, the rises to 2912 m. The Gran Sasso e Monti della Laga National Park was established in 1993 to protect the area's landscapes and wildlife (further discussed below). Europe's southernmost glacier is found on the north slope of the Corno Grande. In spite of the area's proximity to Rome, the area is very quiet even in the summer season; ideal for walking and hiking away from the crowds. Other significant areas include the south part of the Sibillini range and the Majella massif. 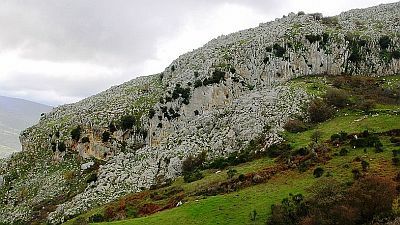 The Majella (also known as Maiella) consists of a compact limestone massif with vast plateaus. The highest point reaches 2793 m. The Majella National Park has been established here, further discussed below. 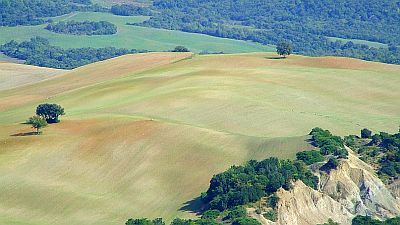 Also see Sibillini & Le Marche region - self-guided walking holiday. The Southern Apennines are more fragmented, consisting of more separate chains, the Pollino mountains, the La Silla mountainous plateau and the Aspromonte massif. Here the mountains are semi-arid. Also included is the Campanian volcanic arc near Naples, which includes Mount Vesuvius, Europe's most active volcano. 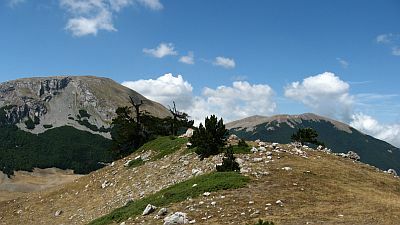 The highest peak in the region is Monte Pollino at 2248 m. There are protected areas, including Pollino National Park and La Sila National Park, that are further discussed below. Monte Pollino in the Southern Apennines in Italy. The area in the north of Italy where the Italian lakes are found is also known as the Italian Lake District. Lying at the foot of the Italian Alps, the Italian lakes offer stunning scenery and great opportunities for a varied walking holiday. The 4 largest lakes are Lake Maggiore, Lake Lugano, Lake Como and Lake Garda. The lakes are glacial lakes, they hav been formed after the ice age. When the enormous glaciers started to melt, they left behind enormous clumps of ice in hollows in the landscape, and these subsequently melted to form the lakes. Other well-known glacial lakes are for example the Great Lakes in the US, and the lakes in the Lake District in England. Typical for glacial lakes is the rugged coastline and the greenish water. This is the result of the high nutrient content of the water, in which fine rockdust, also created by grinding glaciers, is dissolved in the water creating favourable conditions for algae to flourish. View on Lake Como, one of the Italian Lakes. The large water bodies have a large influence on the local climate. A mild, Mediterranean climate prevails, making growth of all sorts of exotic plants and crops possible. The Lakes are very deep, with Lake Como being 400 m deep in places, 200 m below sea level. 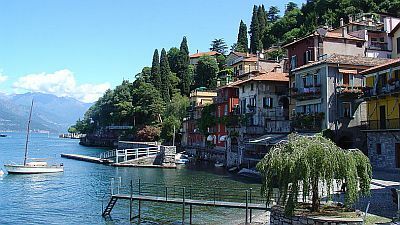 The Italian lakes have always been a attractive places to settle for the wealthy, and you will find many villas with attractive exotic gardens here, many of which can be visited. The combination of history and culture, beautiful scenery, relaxing valley and lake-side walks, and the option of more higher level walking in the mountains creates varied opportunities for a special walking holiday. 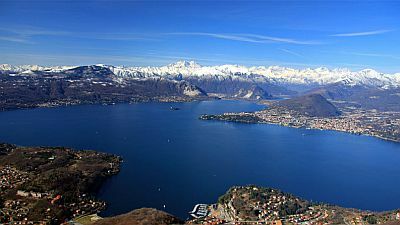 Also see Explore Lake Como - self-guided walking holiday. Of all the regions in Italy, Tuscany is one of the most popular for a walking holiday. The area is known for its beautiful landscapes and rich artistic and cultural heritage. Among the famous people that lived and work here are Dante, Botticelli, Michelangelo, Leonardo da Vinci and Galileo Galilei. Lying in between the Tyrrhenian Sea and the central Apennines (covering part of these), the countryside is dominantly hilly, however, 25% is mountainous. The area has a mild climate in the coastal areas, but inland the climate is more extreme with warm summers and cold winters. Tuscany landscape in the Chianti region. The first major civilisation in the area was created by the Etruscans, later followed by the Romans. Pilgrims travelling along the Via Francigena brought wealth and prosperity to the area in the Medieval period. Tuscany, and in particular Florence, is widely regarded as the birthplace of the Renaissance. Almost all towns and cities in Tuscany have considerable natural and architectural beauty, and in particular Florence has a unique artistic legacy. A typical Tuscany landscape, near the village of Monte Amiata in Italy. Tuscany is also famous for its culinary tradition and wines. Legumes, bread, cheese, vegetables, mushrooms and fresh fruit are widely used together with beef from the Chiana valley and pork. Chianti is the best known Tuscany wine. If you are looking for a combination of walking, art, good cuisine and culture for your walking holiday, Tuscany has a lot to offer. 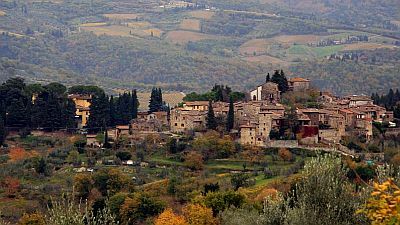 Also see Discover Tuscany - self-guided walking holiday. Sicily is blessed with a unique and rich culture. It is the largest island in the Mediterranean with a hilly landscape that is intensively cultivated. Citrus fruits, olives, wine and olive oil are mainly produced here. Along the northern coast you will find mountains up to 2000m in height. These are a continuation of the Apennines. The east coast is dominated by Europe's tallest and most active volcano, the Etna, which reaches 3320m in height. The area has a typical Mediterranean climate with mild wet winters and warm hot summers. The Nebrodi Mountains region is the island's largest protected area. It preserves Sicily's largest woodland area but there are also wetlands and rocky habitats. The area is very different in character to the rest of Sicily, being much greener and lusher, with water elements and very rich vegetation. There are both walking and thematic nature trails in the area for those wanting to explore the area by walking. Nebrodi regional nature park on Sicily. There are 24 national parks in Italy, many of which are a great destination for a walking or hiking holiday. Some of the most significant are discussed below. Gran Paradiso National Park is located in the west of Italy, in the Graian Alps, south of the Mont Blanc massif. 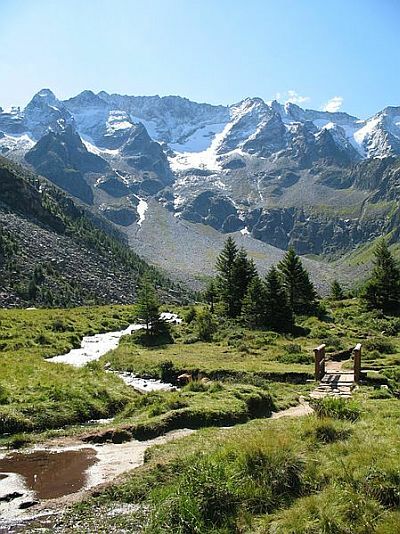 It was Europe's very first national park, and with just over 70,000 ha its a pretty large area with an extremely varied relief, ranging from 800m in the valley bottoms to more than 4000m at the highest peak, the Gran Paradiso. Habitats consist of alpine grasslands, pine woods, glaciers, rocks and rivers and streams. Alpine Ibex are one of the iconic species in the area, grazing the alpine pastures. Popular places include Piano del Nivolet, a very beautiful plateau at 2500m, and the Cogne Valley, where you find the Gran Paradiso glacier. The walk from Valnontey to Vittorio Sella Mountain Hut is also very well-known. There are several visitor centres in the area and many well-marked footpaths. Long distance walks and hut to hut hiking are also possible. See Gran Paradiso National Park's website for more information. Ibex in Gran Paradiso National Park in Italy. The Val Grande National park lies in the east of the Pennine alps, from here you have beautiful views to Lake Maggiore and the Monte Rosa massif. This park is Italy's biggest wilderness areas, where summer pastures have been abandoned by farmers, and forestry has ceased. You can also see the remains of the ancient alpine communities that used to work and live here. There are no roads or permanent settlements in the area now, so it is perfect for walkers looking for something away from the beaten path. Higher up in the mountains paths are more rough and challenging in spite of the limited heights (2301m maximum) but especially in the Val d'Ossola there are also more gentle walks. A good starting point is the area's visitor centres. See Val Grande National Park's website for more information. View on Val Grande National Park in Italy. Stelvio National Park, also known as Stilfersjoch National Park, is found in the south part of the Ortler Alps. It is the largest national park, not only in the Italian Alps but in the whole of the Alpine chain. With many glaciers, streams, alpine meadows, forests and picturesque settlements, the area is great for walking and hiking, with many themed trails and marked routes, also to mountain huts in stunning settings. There are relaxing walks in the valley with more challenging walks high up in the mountains. 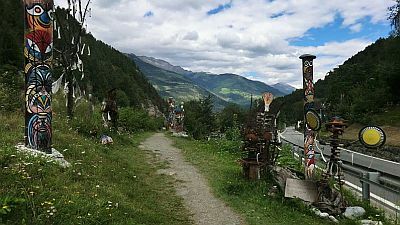 A path in Stelvio national park with an open air art exhibition. See Stelvio National Park's website (only in Italian) for more information. Dolomites National Park, or Dolomiti Bellunesi National Park, is a 31,000 ha protected area in the central-southern part of the range. Because parts of these mountains were not glaciated during the ice ages, a very special flora and fauna can be found here. Next to many marked walking routes, there are the famous via ferrati, or "routes with irons". These are high mountain routes, of which the original routes were used during the world war. Now they are superb high mountain trails with ropes and support cables, and many additional routes have been created, also in other countries. There are also many nature and thematic trails in the area, with interpretation boards. See Dolomites National Park's website for more information. Sibillini National Park or Monte Sibillini, is centered around the Sibillini massif that reaches a height of 2478m at Mount Vettore. Ancient medieval towns and village lie at the foot of the mountains, while the more inaccessible and less-visited parts of the area still support rare species such as wolf, golden eagle and pergrine. The spring and summer flora is simply amazing. There is a dense network of walking routes, that bring you to interesting natural and historic-cultural sights. The walking available is varied, from easy walks in the valley to more demanding walks higher up in the mountains. There is also a marked trail that runs through the whole chain and takes about 9 days to complete. Not all routes are marked in the park, and local knowledge is therefore very important when you want to walk in the Sibillini mountains. See Sibillini National Park's website for more information. 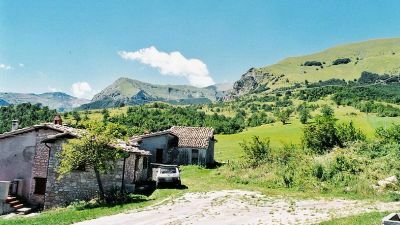 A rural scene in Sibillini National Park. See Majella National Park's website for more information. 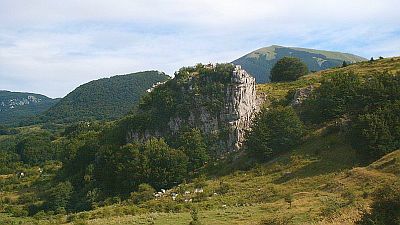 Pollino National park in the south Apennines has only recently been established. In the highest areas you'll find relict population of the last glaciation, with the most famous being the Bosnian Pine. The slopes of the mountains are heavily forested with beech and chestnut trees. The karts landscape is varied with gorges, caves and high altitude pastures. There are many marked walking routes and trails in the area. A good starting point is the national park offices for information. See Pollino National Park's website (only in Italian) for more information. The landscape of the Sila National park region consists of forests covering gentle plateaus, with varied landscapes stretching out towards Pollino, Aspromonte, Etna, and the Ionian Tyrrhenian Sea. A network of marked walking routes and thematic trails has been established. See La Sila National Park's website (limited text in English) for more information. 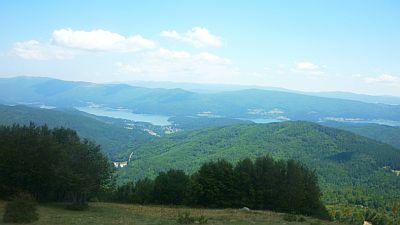 The La Sila area in Italy. With a varied relief and a very long shape of the country, the distance from north to south is about 1200 km, the types of climate found in Italy is diverse. In the Alpine regions in the north you'll find alpine climates with lots of snowfall and late springs and cool summers. As you go further down and come closer to the coast, the climate becomes Mediterranean with wet mild winters and dry hot summers. Inland experiences a more continental climate with cold winters and hot dry summers. Inland northern areas even experience a humid subtropical climate. Italy's stable sunny climate means there is plenty of excellent walking and hiking weather. However, in general, climate patterns are complicated by the various mountains and hills that create unique microclimates in many areas. The east coast is not as wet in as the west coast, but is colder in winter. In summer the weather is generally stable, but there can be quite a few thunderstorms and cloudy and grey days in the mountain regions. Largest snowfall usually happens in February in the Apennines, but the alpine regions receive most of their snow in spring and autumn because high in the mountains the heart of winter often means clear blue skies. Like in many countries with a rich and complex climate pattern, the right time for a walking holiday in Italy depends very much on where you actually want to go. Generally though, in the coastal areas and inland and southerly areas that experience a land and Mediterranean climate with hot dry summers, the best time is spring or autumn. Spring brings a carpet of wildflowers, blossoming fruit trees and a lush green landscape. However, walking in glorious autumn weather can also be fantastic, with the rich colours of autumn giving the landscape something very special. The cooler spring and autumn temperatures in these areas are ideal for walking. Spring in the Italian Alps. In the high mountains and alps however, spring might come quite late, sometimes only in June with lingering snowpatches making some paths inaccessible. Here the summer months can be the best time, when temperatures high in the mountains are much cooler and ideal for walking and hiking. Wherever you are planning to go walking in Italy, it is always best to enquire locally about the best timing of a walking holiday. The holiday providers on the walkingholidayinfo.co.uk website are all local businesses that known their paths and trails like the back of their hand, and can give you the best advice on the local conditions and ideal timing for a walking holiday to their particular area.